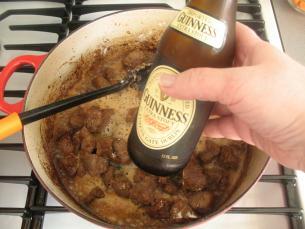 Guinness Stout Beef Stew is rich and hearty and a perfect meal to serve on a cold day. Of course, it’s a must for St Patrick’s Day, which here in Boston is a huge celebration! 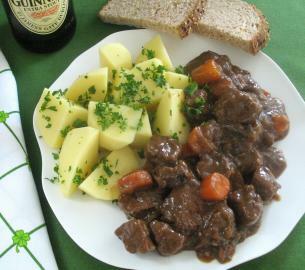 You can serve this stew for Sunday lunch and then, late in the day, try some of startcooking.com’s Irish Bread with Irish Coffee. 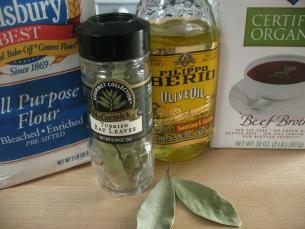 From the pantry, you will need white flour, oil, beef broth and bay leaves. Remember to remove the bay leaf before serving! 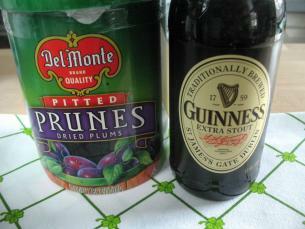 You will also need pitted prunes along with the Guinness Stout. Second, do not replace the “Extra Stout” with “draught” or with those bottles of Guinness with the widgets in them that make the foam. The taste will be all wrong! 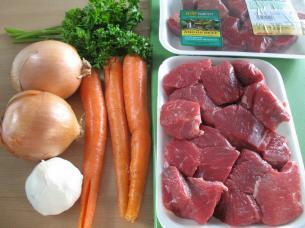 Begin by getting the carrots, onions, garlic and beef all cut up and ready to cook. 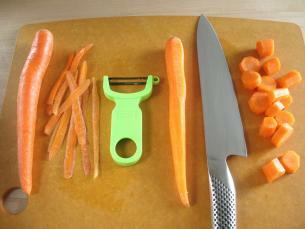 Peel the carrots and cut them into chunky slices about 1/2 inch thick. 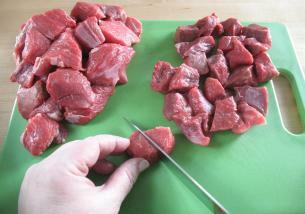 Cut the stew beef into approximately 1 inch chunks. 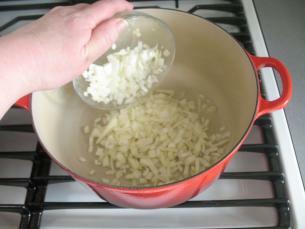 In a large, heavy, Dutch oven, set on medium high; heat the oil and sauté (fry) the onions for about 3-4 minutes. 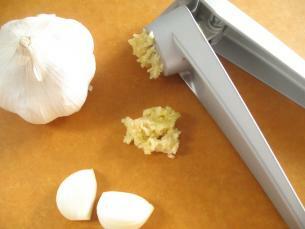 Add the garlic and continue cooking for another 30 seconds. 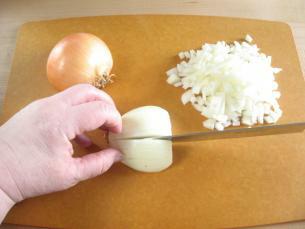 Remove the onions and garlic from the pot. The photo below is why not! 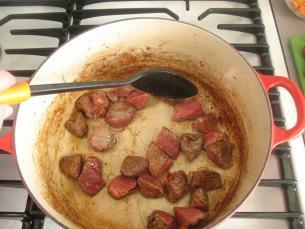 If you overcrowd the pan the meat will get foamy and bubbly, and not develop a nice rich browned color. …will guarantee a nicely browned meat. 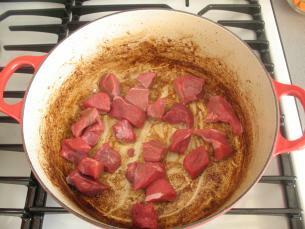 Remove the meat from the pan…. …and add the next batch. 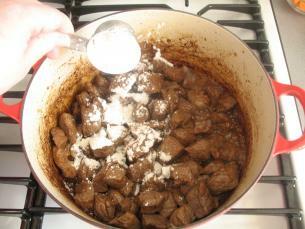 When all the meat is browned, add it all back to the pot. 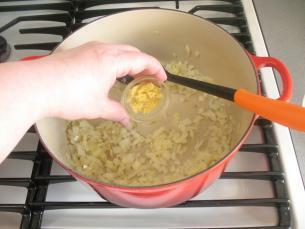 …and stir everything until mixture comes to a simmer. The beer/broth should cover all the ingredients. If it does not, you may need to add a bit more broth. 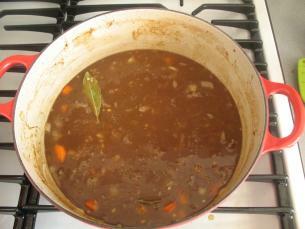 Simmer the stew gently, uncovered, for one hour. 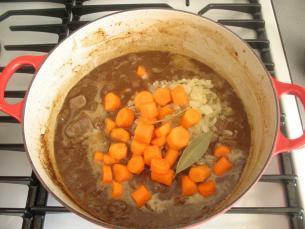 (There should only be tiny little bubbles with the occasional waft of steam coming from the stew.) Be sure to give it an occasional stir. While the stew is simmering, chop the prunes. 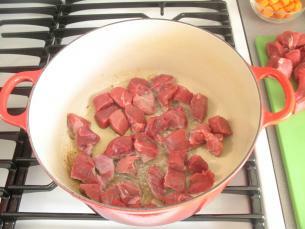 …and continue cooking the stew for another 1/2 hour. 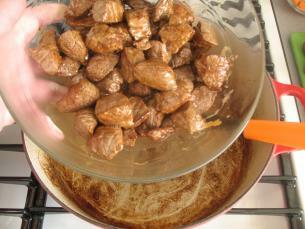 The prunes will “melt” into the stew and the gravy will develop a wonderful rich flavor and have a nice glossy finish. are perfect to serve with this stew. Don’t forget to remove the bay leaves! 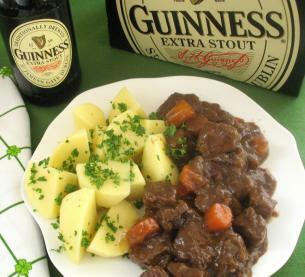 Kathy – the Guiness Stout Beef Stew looks great and I would like to make it for Sunday – one day before St. Patrick’s. Some of my guests cannot take alcohol so I’m wondering if it will ‘cook away’ leaving only the taste. Great pictures. Makes me want to make a stew tonight. I think I will have to buy prunes now. I thought I’d be 50 before I’d do that! Hi John, the general thinking is that the alcohol will cook away. This article says a certain amount will in fact remain. 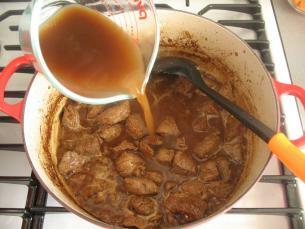 If you choose to make this recipe with all beef broth and no stout, omit the prunes as well. They will make the stew too sweet! 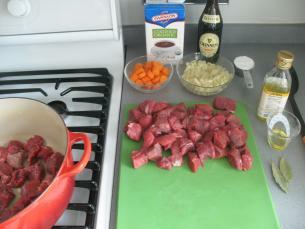 Or you could try my other Beef Stew video recipe and substitute the wine for beef broth. This looks delicious. 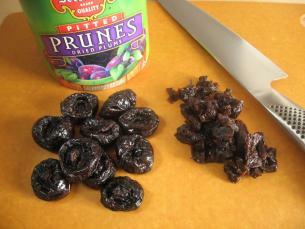 I wonder if honey dates could be substituted for the prunes, for those whose diets can’t include canned fruits. This looks delicious. I think I might have to make this tomorrow. This is an interesting recipe, espcially the prunes. I’ve never heard of prunes being used in a stew, seems a little odd to me. Stews have never struck me as something that needs sweetness (but then i’ve never used beer in a stew), so I’m interested to see how this tastes. I think that you are very good. For a non-alcoholic version you could substitute O’Douls for the Guinness. America’s Test Kitchen says it is a good cooking beer. You CAN eat bay leaves. It’s just advised to cut the leaves into more easliy swollowed pieces, or at least chew them well. I’m going to have to try this today. My current recipe is pretty similar save for the prunes. Really curious to see what they add to the stew. I would have never thought to include them on my own. Seriously? This is called GUINNESS stew. 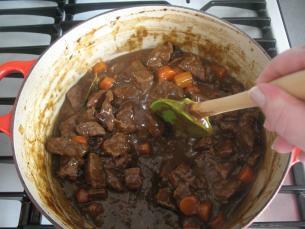 If you want a non-alcoholic beef stew, there are tons of other recipes out there. You can’t substitute Guinness with beer (alcoholic or not), as it won’t impart the same flavors – at all. Substituting O’Doul’s for the Guinness will work in the sense that it will make a stew, but an alcohol-free lager will not taste anything like a rich, dark stout like Guinness. An hour and a half of simmering will certainly cook out almost all of the alcohol from the stew, so if your guest is concerned about alcohol remaining in active amounts then you’ll be fine. However, if your guest cannot tolerate any quantity of alcohol — for example, for religious reasons — then you’re not going to be able to accomodate that. You simply can’t ever remove all traces of ethanol from the stew. MikeW rightly notes that the alcohol in the beer will lower the simmering temperature until it is gone. This is in fact one of the reasons the alcohol is useful, so cooking it out in advance (or switching to a non-alcoholic broth) will change the cooking slightly, making the meat a little less tender by raising the initial cooking temperature. While it’s true that “some” alcohol remains, it’s not enough to be concerned with. It’s criminally easy to play games with percentages if you want to frighten someone. The mass media does it all the time to rile people up. But, if you look at the various charts available, then do a little math, the numbers get vanishingly small and insignificant. For instance, this recipe looks like it’s making about 2 quarts. That’s 64 ounces. 12 of those (or 18%) are beer, which contains roughly 5% alcohol. So, now the beer is diluted by a 5:1 ratio, meaning our entire stew is at about 1% alcohol. It gets simmered for an hour and a half, which according to the chart linked to earlier, reduces the amount of alcohol by 80%, leaving 20% in the recipe. 20% of 1% is .2%. Since someone might actually only eat a 16oz. plate of the stew, they’re only going to get a little over 6% of that .2% of alcohol that’s left, so now we’re only talking about .012% alcohol content in a serving. That’s a little over 1/100 of 1%. That’s another way of saying “non-existent”, although to be technical, there is “some” alcohol left. Not nearly as much as there is in “alcohol-free” beer (O’Doul’s is at .4%), but “some”, nonetheless. So, don’t worry. 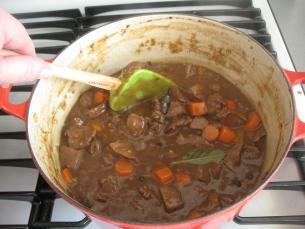 Make the stew as described, and enjoy! Love, Luck and God’s Blessings to one and all! What a fascinating take on stew. This is going straight onto my To Try list. I bet I’ll love it. Thanks. The amount of pure alcohol (ethanol) per serving is actually lower then has been suggested. To help you picture it: 0.614880002 teaspoons ethanol is left in all of the stew at this point. Blood Alcohol Content (BAC) can be roughly estimated using a mathematical approach. It can be useful for calculating a BAC level that is not currently testable, or a level that may be present in the future. While there are several ways to calculate a BAC, one of the most effective ways is to simply measure the total amount of alcohol consumed divided by the total amount of water in the body—effectively giving the percent alcohol per volume water in the blood. The total water weight of an individual can be calculated by multiplying his or her body weight by their percent water. Gender plays an important role in the total amount of water that a person has. In general, men have a higher percent of water per pound (58%) than women (49%). For example, a 150 pound woman would have a total amount of water of 73.5 pounds (150 x .49). For easiest calculations, this weight should be in kilograms, which can be easily converted by multiplying the total pounds by 0.45359237, because 1 pound = 0.45359237 kilograms. 1) It is not strictly accurate to say that the water content of a person alone is responsible for the dissolution of alcohol within the body, because alcohol does dissolve in fatty tissue as well. When it does, a certain amount of alcohol is temporarily taken out of the blood and briefly stored in the fat. Additionally only about 7% of human weight is from blood. For these reasons, most calculations of alcohol to body mass simply use the weight of the individual, and not specifically their water content. Since I have used this method above, the numbers are actually slightly exagerating the potency of the alcohol. 2) I believe that as the ethanol is boiled with the other ingredients, new compounds may be formed. This would change the molecular structure of some of the ethanol, thus rendering the alcholic properties null. I can’t find anything to substantiate this, so I’d love to see other people’s input. Cooked this saturday night.. It went fast.. The flavor of this stew is amazing esp considering there really isnt much to it! was wondering how much of the amounts are needed of each ingredients. i put a the whole broth container in and 1 whole beer. Well, I made this stew last night and it couldn’t have been easier! Instructions were super easy to follow (thanks to Kathy’s great photos). It’s a breeze to prepare, and most of the time is just spent in waiting time to cook, which is really no big deal since I happen to work from home. The whole thing was cooking while I was on a long business meeting. It was totally delicious and my hubby was thrilled with it and has already asked when we’re making it again! Thanks Kathy for another great and easy recipe. For a change of pace I sometimes make the stew and then turn it into a Beef Pot Pie. My husband loves it! The stout has a really intense flavor and too much of it can overwhelm the stew! 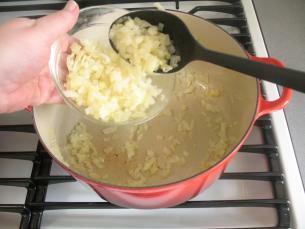 Potatoes absorb a ton of moisture- which is why you needed more liquid in the stew. Beef broth or just water would have been a much better option. I am glad to hear it was still a hit! Just clicked because I wanted to check if I was on the right way, and these instructions are excellent! Thanks Ana! Tis the season for a nice hot stew! I’m wondering how this stew would translate to a crockpot/slow cooker recipe. Any ideas? Hi OT! I do not own a crock pot/slow cooker and have never cooked with one. My guess is that this recipe may well need more liquid to cook in crock pot. IF so I would add beef broth and not extra stout beer. Now that cold weather is here, I love making your stew. 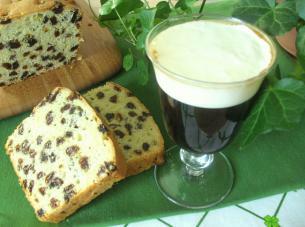 I wonder about the suggested Irish bread – which is called Spotted Dog in my family. Wouldn’t a recipe for Irish soda bread be a better choice with such a rich stew? My Irish Bread is more like a cake than a bread. It is more for a snack, breakfast or something to have with tea or coffee kind of bread, rather than serving it with this stew. I went in Dublin last year and I ate the Irish Guinness Stew finding it so delicious!!! So yesterday evening I decided to make this dish for a dinner with friends..and my guests were been enraptured..so I’ve to thank you so much! WOW! Mariangela that’s great to hear! 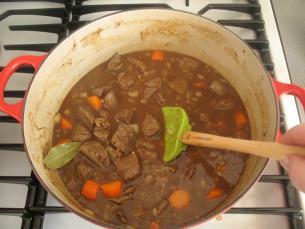 This is a very rich, hearty beef stew – great for the meat lovers in the crowd! 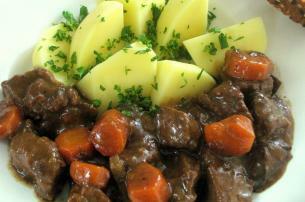 I was wondering how this stew would do if you made it ahead of time and froze (without the potatoes of course)? We are having an engagement party for my Daughter in Feb and the theme is Irish. I need to make it for 80 people and there will be other dishes as well. HELP. Although many folks do freeze stews, I have never had much luck doing so. The gravy tends to separate and just does not reheat to that silky smooth consistency that the stew had when it was first made. Therefore I would not recommend this recipe for your party. You could try corned beef brisket with all the trimmings. Brisket is great made two or three days in advance and sliced when it is cold. I have also had great luck freezing cooked, unsliced brisket. My recipe is for cooking brisket on the stove top but you could cook 5-6 briskets all at once in the oven. I made a stew (videojug.com) pretty close to this. I didn’t use prunes, I used a couple of tablespoonfulls of sugar. 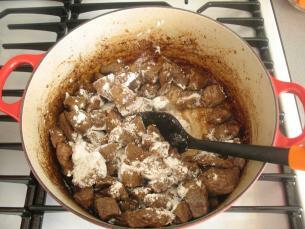 Put the meat, sugar, and a couple of tablespoons of flour in a freezer bag with salt and pepper. Shake it all about! Then follow the recipe above. It really is important, as the author says, to brown small batches of meat, but Jamie Oliver reckons browning is not necessary. Thanks for all your tips! I often have trouble freezing stews. 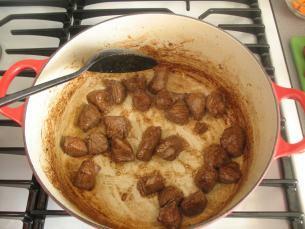 When defrosting and reheating the stew, the gravy never quite returns to its original texture. I’ll have to give it another try. I use maize / cornflour for thickening sometimes. I wonder if using more onion (Indian food uses them for thickening) or grated floury potatoes would work better? Reminds me of an old Royal Air Force saying: “If you walk away from it, it was a good landing”. So, if my girldriend doesn’t die after my cooking, it was OK…. Andy you sound like a great cook! All great cooks have such a wonderful sense of humor! You are absolutely correct that the thickening agent of the stew effects the the success of the freezing and reheating process. Rice flour supposedly does not cause the stew to separate as much as plain white flour, but I have never tested that theory. Reheating slowing and stirring gently but often will help to return the stew to its original texture but you do have to be careful not to break down the other ingredients with too vigorous stirring. Nice touch adding the chopped prunes. They do work well with the Guinness, giving a very nice flavor. The prunes really do help to balance the flavor! 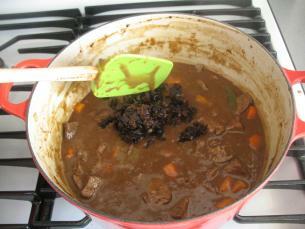 Hi all…just wondering how the stew froze? And can you freeze the potatoes separately? The stew freezes just fine, but the potatoes will suffer and freezing them separately won’t help. While raw potatoes make it through the freeze/thaw cycle fairly well, cooked ones don’t. I’m not sure why, but I suspect it has to do with how much liquid they absorb during cooking. The liquid expands when it freezes, wrecking the cellular structure of the things and making the texture less than perfect. They come out somewhat “grainy”. Fish and many fruits suffer the same way for the same reason. One solution is to dice up fresh potatoes into fairly small cubes as needed when you pull the frozen stew for service. 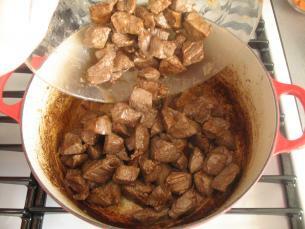 Because of their size, they cook fairly fast, and you can use the stew as a cooking liquid. The potatoes absorb the stew’s flavor while maintaining the good texture and flavor of a fresh veggie. Just be careful you don’t overcook the stew. Or, you could nuke the little taters close to done and add them to the stew to finish them off. Thank you very much for such an informative answer. Much appreciated. I have been messing around with freezing and found that potatoes mashed with cream will freeze well if you add a “whip cream stabilizer”. You mentioned fish in your post, is there any type you have found that does freeze ok? I would like to make and freeze a fish curry (coconut milk freezes well). No, fish are flimsy and mostly water, like tomatoes, so freezing them breaks them. Some of the meatier species, such as salmon or tuna, do better than others, but their flavor is so strong I don’t know if anybody makes curries or stews out of them. Although I don’t think it would help you with the fish recipes, something to keep in mind for stews is using a pressure cooker. You can cut hours off of cooking time so you don’t have to make a big batch and freeze the leftovers to justify the trouble. Just make a meal or two’s worth, and call it a love story.